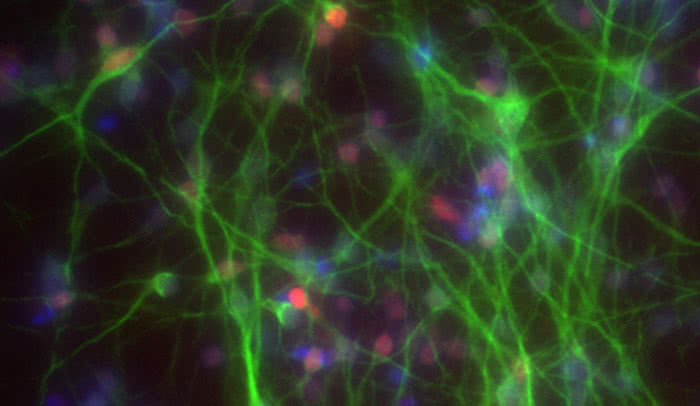 Out of body: Researchers in the Tessier-Lavigne lab use human brain neurons (above) derived from stem cells to study dementia. A new approach developed in the lab allows them to more efficiently introduce mutations associated with diseases, such as Alzheimer’s. To explore in detail how specific genetic errors can lead to disease, scientists need to perform experiments in cells that carry these exact mutations. Now, the ability to create these cellular replicas using new genome editing technology has been facilitated thanks to work by Rockefeller University researchers. Previously, this technology, the much-talked about CRISPR-Cas9 system, could not make the changes efficiently and accurately enough to be used widely by the scientific community. “This new method makes it much more straightforward for researchers to precisely insert disease-causing versions of genes into cells, and thereby to develop cellular models that more closely mimic the conditions within the human body—creating more opportunity for biomedical research into a wide range of debilitating or deadly conditions,” says senior author Marc Tessier-Lavigne, Carson Family Professor, head of the Laboratory of Brain Development and Repair, and the university’s president. In work described recently in Nature, the team applied their technology to generate neurons that looked like those in the brains of people suffering from Alzheimer’s disease. Over the years, researchers have devised a number of strategies for mimicking disease in laboratory-grown cells. When trying to turn cells into models of a particular human disease, researchers want to cut the DNA in order to replace an existing bit of sequence with a substitute. With the discovery of the CRISPR-Cas9 system, which is derived from a bacterial immune defense system, scientists gained a new tool to precisely and easily cut a cell’s DNA. However, some significant drawbacks have so far impeded scientists in using it to engineer disease-afflicted cells. Rockefeller postdoc Dominik Paquet and graduate student Dylan Kwart, who are co-authors on the study, first attempted to use CRISPR-Cas9 to insert two genetic mutations linked with the production of amyloid-β, a protein implicated in Alzheimer’s disease. Their success rate was initially dismal, with only a very small fraction of the cells carrying the desired versions of the genes and no new errors. The primary problem is that CRISPR-Cas9 keeps on cutting the cell’s DNA over and over again, with the cell’s own repair machinery repairing each cut until it makes a mistake that prevents further cutting. These mistakes can potentially create new, unintended problems for the cell. The research team, which also included scientists from the New York Stem Cell Foundation Research Institute, evaluated an approach that scientists in the field have been discussing for some time: introducing blocking mutations to prevent further cutting after the first slice. By introducing these blocks in one of the two different sections of DNA that are required for target detection by CRISPR-Cas9, they were able to dramatically decrease unintended errors. Errors weren’t the only issue. Like all genes in our cells, those implicated in Alzheimer’s exist in two copies, and patients typically carry one normal and one mutated copy. This posed a problem for the researchers because there is no way to tell CRISPR-Cas9 to edit only one gene copy and leave the other alone. When the team looked closely at the sequences produced by using CRISPR-Cas9 to add either of the two Alzheimer’s mutations, they found a pattern that seemed to revolve around distance—that is, the length of sequence between the site where CRISPR-Cas9 made its cut and the mutation they intended to introduce into the recipient cell. With this strategy, the researchers edited the genomes of stem cells to contain one copy of either of the two Alzheimer’s genes. They then coaxed those cells to become neurons, which produced large amounts of amyloid-β, just as in Alzheimer’s disease. This research was supported by The Rockefeller University, The New York Stem Cell Foundation, The Ellison Foundation, and the Cure Alzheimer’s Fund.